Albacore catches in the North Atlantic peaked in the 1960’s at 60,000 tonnes. In 2013, 20.948 mt of albacore were caught in the North Atlantic Ocean, with Spain landing the majority of the catch. In the past two years, Canada has imported about 300 tonnes of albacore from the US. Albacore tuna have life history characteristics that make the moderately vulnerable to overfishing. The abundance in the North Atlantic Ocean is low but is not experiencing overfishing. Biomass has been increasing in the North Atlantic. The management body responsible for the albacore tuna in the North Atlantic Ocean is the International Commission for the Conservation of Atlantic Tunas (ICCAT). Albacore tuna in the North Atlantic has been under a rebuilding plan since 2009 which was updated in 2013. Regular stock assessments are conducted and scientific research and monitoring is highly effective. Management is moderately effective as ICCAT is working on the development of several measures but improvements are needed. Management generally follows scientific advice. Trolls and poles-and-line cause minimal bycatch rates. Species of concern are not caught as bycatch, and any non-target species can be released live due to the nature of the fishing method. Trolls and poles-and-line do not make contact with the ocean floor and therefore cause little to no habitat damage. The effect of removing albacore tuna and its baitfish from the ecosystem is being explored with ecological risk assessments and ecosystem based models. The Hawaiian longline fishery uses both shallow-set and deep-set longlines, primarily to target swordfish and bigeye tuna. Longline landings of albacore tuna (mostly from the deep-set fishery) peaked during the mid-to-late 1990s and early 2000s (i.e., 1,645 t in 1997) and have since declined. In 2010, only 416 t of albacore were landed by this fishery. Albacore tuna have life history characteristics that make them moderately vulnerable to overfishing. Based on the most recent stock assessment, the albacore tuna stock in the Pacific Ocean is healthy and is not being overfished. The longline fisheries in Hawaii are fishery are managed by the state of Hawaii and the US Western Pacific Regional Fishery Management Council (WPRFMC). Given that they target highly migratory species (i.e., swordfish and tuna), these fisheries are also under the jurisdiction of the Western and Central Pacific Fisheries Commission (WCPFC) in the west Pacific and Inter-American Tropical Tuna Commission (IATTC) in the east. Domestic measures are moderately effective, and place emphasis on preventing overfished stock status. Nonetheless, no overfishing reference points currently exist for albacore. Observer coverage is 100% in the shallow-set fishery and 20% in the deep-set and bycatch monitoring and mitigation efforts are highly effective. Typically, deep-set longlines catch fewer seabirds and sea turtles than shallow-set lines. However, deep-set lines are known to occasionally catch larger marine species, including whales and sharks. Specifically, the Hawaiian deep-set longline fishery has some bycatch of false killer whales and shortfin mako sharks. Deep-set longlines rarely contact the seafloor. As such, they have minimal impact on the surrounding marine environment. The species caught in the Hawaii longline fisheries are managed under a Fishery Ecosystem Plan that aims to address fishery effects on other species, habitats and the ecosystem as a whole. However, the continued removal of large predatory fish from the ecosystem is not yet fully understood. 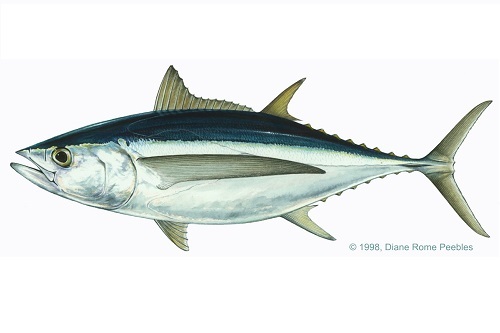 The majority of tuna caught globally are caught by longline; however trolls are a significant fishing method for albacore tuna in the North Pacific. In 2013, 92,900 mt of albacore were caught in the North Pacific Ocean, with 34% caught by troll and 40% caught by longline. Troll and pole-and-line fisheries target juveniles. Canada troll fisheries caught 7,956 mt of albacore in 2004, up from a low of 2,734 mt in 1999. About 8% of the albacore tuna on the US marketplace is imported from Canada. Albacore tuna have life history characteristics that make the moderately vulnerable to overfishing. Based on the most recent 2014 stock assessment, the albacore tuna stock is healthy and is not being overfished. The two management bodies responsible for the albacore tuna in the North Pacific Ocean are the Western and Central Pacific Fisheries Management Council (WCPFC) and the Inter-American Tropical Tuna Commission (IATTC). Canada complies with both management bodies as well as Fisheries and Oceans Canada. Regular stock assessments are performed, management follows scientific advice, and regulations are enforced. Management in Canada, the US and Japan is moderately effective. Trolls and poles-and-line cause minimal bycatch rates – an average of 0.1% of the catch is non-target species. Species of concern are not caught as bycatch, and any non-target species can be released live due to the nature of the fishing method. Trolls and poles-and-line do not make contact with the ocean floor and therefore cause little to no habitat damage. The effect of removing albacore tuna and its baitfish from the ecosystem is being explored with ecological risk assessments and ecosystem based models. Globally, almost all albacore tuna are caught with longlines or troll/pole-and-line gears. Annual longline landings in the north Pacific Ocean are currently around 30,000 t, with an additional 60,000 t being landed in the south Pacific. Albacore tuna have life history characteristics that make them moderately vulnerable to overfishing. The albacore populations in both the north and south Pacific Ocean are not overfished, with no overfishing occurring at present. In the Pacific Ocean, albacore tuna are managed by the Inter-American Tropical Tuna Commission (IATTC) in the east, and the Western and Central Pacific Fisheries Commission (WCPFC) in the west. Target and limit reference points, as well as harvest control rules are being established, and countries must report their catches. In general, management of albacore is moderately effective. However, there are substantial concerns regarding bycatch mitigation and management. Measures exist to reduce bycatch levels, but there are currently no bycatch limits on species. Pelagic longlines are a nonspecific fishing method. Non-target species caught by the Indian Ocean fleet include critically endangered leatherback turtles, as well as threatened silky, shorkfin mako, and blue sharks. Numerous species of endangered albatross are caught in the southern Indian Ocean and although measures exist to reduce and monitor bycatch levels, compliance by fishing countries has been low and these measures have thus far been ineffective. Pelagic longlines have minimal impacts on the habitat as they rarely make contact with the seafloor. Nonetheless, the fishery catches ecologically important species such as other tunas, billfish, turtles, and sharks. The removal of these species in large numbers from the ecosystem is not yet fully understood. Albacore abundance in the South Atlantic Ocean is currently low and the stock is experiencing overfishing. Management is moderately effective as the ICCAT is working on the development of several measures but improvements are needed. The stock is not under a specific recovery plan at present and there are concerns that management has set catch levels that may be too high to allow for recovery of the population. Regardless of gear, concerns over stock status and ineffective management are substantial and albacore caught in this region are not recommended.